At the ripe old age of 32, I’m already as close to a crazy cat lady as you can get. We don’t have kids — but we do have three cats. It was only supposed to be two but then I found a needy stray and... well yes, I’m that person. My pants right now? Cat print? My boyfriend? 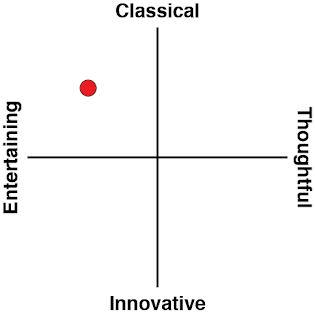 Disappointingly human. Related reading: If birds are more your style, try dating them in Hatoful Boyfriend on the PS4. On one hand, I love him immensely and couldn’t be with anyone else. On the other, I love cats. I love their little mews and big mreows and fluffy butts and teddy bear toes. I love to pet their tummies and fetch them treats and let them sleep on my lap until my hips ache. 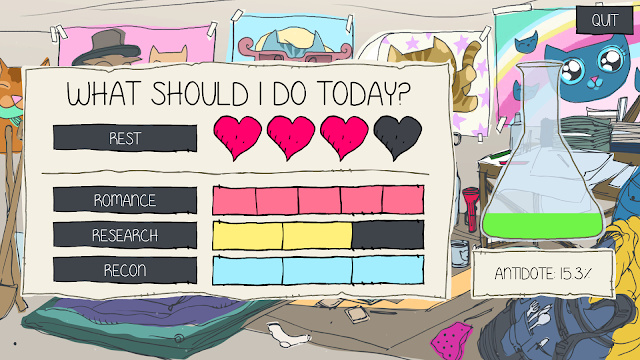 Purrfect Date is the perfect solution to my exceedingly common problem. It puts you in the place of a researcher heading to Verloren Island, AKA Cat Island, a place almost exclusively by (mostly) furry friends. Upon the island you meet the few folks around, led by your new boss: Professor Pawpur. The cat theme is endless. There are cats in the credits and cats in the loading screens and cats in the menus and cats singing in the background. I've got cat fever and the only cure is more cats! No, wait. It seems as though, as a researcher, you do have a sort of cat fever that turns you into a cat. And there is no cure, that's why Professor Pawpur keeps needing new staff. Luckily, once you actually begin work on the island you'll begin working towards a cure for the Feline Transitional Gene. I love working on Cat Island. Cat Island is one filled with my people: cats or cat-lovers, exclusively. Researching can involve anything Professor Pawpur wants you to do: meeting cats, crating cats, grooming cats, etc. When you're not hard at work for him, you can use the time to rest or do recon. Resting is mostly self-explanatory, as you get to take the day off and perhaps enjoy a good book or a nap. Or be accosted by cats, you never know. Recon is the like the super-spy aspect to Purrfect Date. You can't tell Professor Pawpur about the Feline Transitional Gene, not to mention other odd events occurring on Cat Island -- he would think you're loony, and maybe you are, a bit. Be stealth and go behind the Professor's back to conduct interviews, environmental research, or project analysis. Aside from why humans are turning into cats, the mysteries are aplenty: weird creams with increasing numbers keep surfacing and there's a weird force field around the island, for a start. We've covered do research, do recon, take a rest, and now we have come to... romance the cats? As Professor Pawpur is quoted as saying, “A scientist must keep an open mind.” It sounds strange, but it’s the romancing is really more friendmancing, if I may make up a word. There’s love there but the romance itself seems to be only on the surface -- which is kind of reassuring considering it begins as a human-feline relationship. Oddly enough, for a dating sim I far prefer the other options of research and recon. 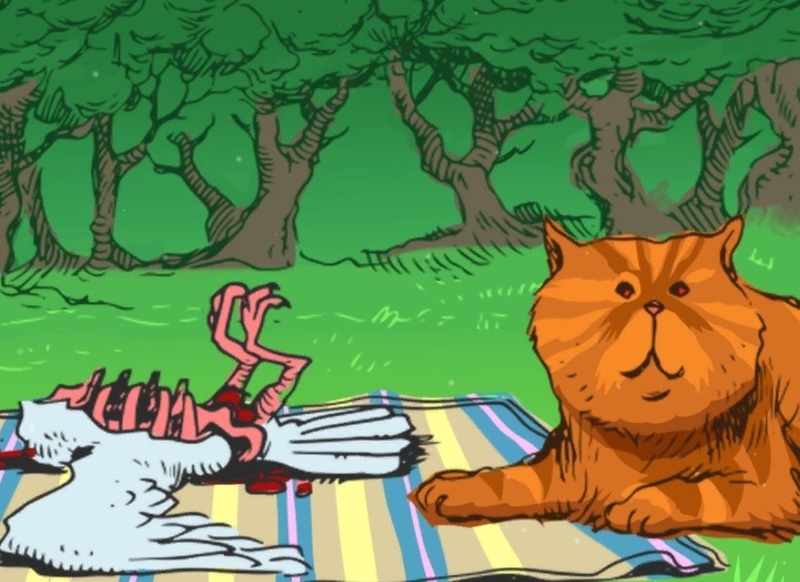 Romancing cats is just the means to an end (education! ), and if I fall in love with a furry being in the meantime so be it! 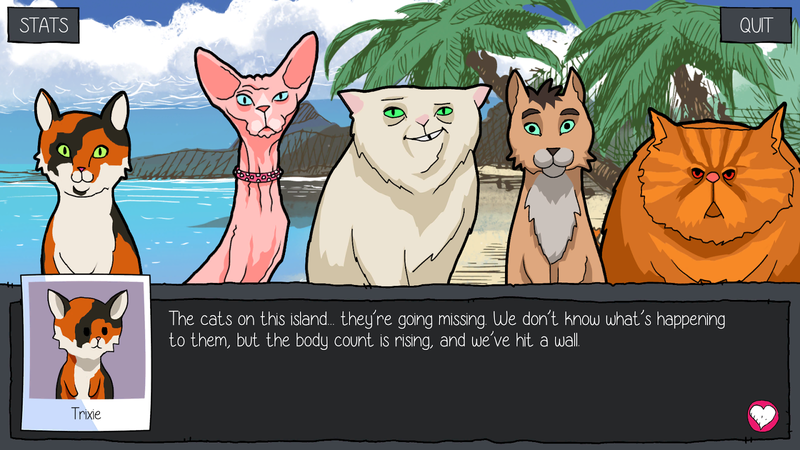 The dateable cats are one heck of a cast. 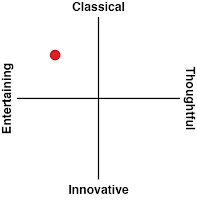 Each has its own unique physical characteristics as well as the personality to match. 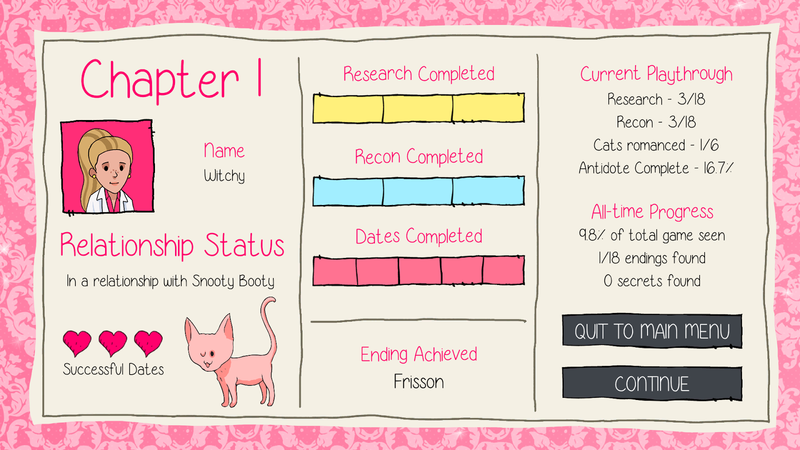 For example, take Snooty Booty "Snoots" is a snobby furless cat who is currently involved heavily in a romantic relationship with a cat who just happens to be my former colleague. Poor Witchy spends all day, every day, catering to the needs of Snooty Booty, but it's so very worth it when her loving side comes out. Another favourite of mine is Floofybutt. This giant orange floofball looks like a goof but is actually highly educated (for a cat). He prefers to be called Major but I call him Doctor due to his affinity for dissecting other animals. Also of note are the Elders, or Mewlers. These arguably feral cats are carriers of the Feline Transitional Gene that infects humans. Yet I can't help but be drawn to them. The mystery! The intrigue! The fur! In the game you're left questioning your relationship decisions. Should I have said the truth or told a white lie? Cats are fickle, it may shock you to learn. Even if the answer goes in one direction at one time, the cat could react completely differently next time. Past the Elders and the dateable cats, you will encounter many more on your journey. Black cats! Kittens! All need your help! This may as well be a vet game, but then I wouldn't be experiencing quite the wave of floofy love and affection that hits me time after time. Don't get me wrong: there is loads of content here. If you're not occupied for at least ten hours I'll eat my hat (please don't hold me to that, quick readers). The background music is worth noting, as it fades into the background at a calming pace. Every now and then a gentle singing of "meow meow meow" will begin over the music. It's a nice touch that doesn't overwhelm the game with an annoying amount of catty sounds. The cats themselves will meow and mew and hiss, and those sounds are wonderfully life-like, but the soft meow meow meow music is where my ears want to stay. I'd like to give a quick shoutout to the devs for making the text large enough to actually read. 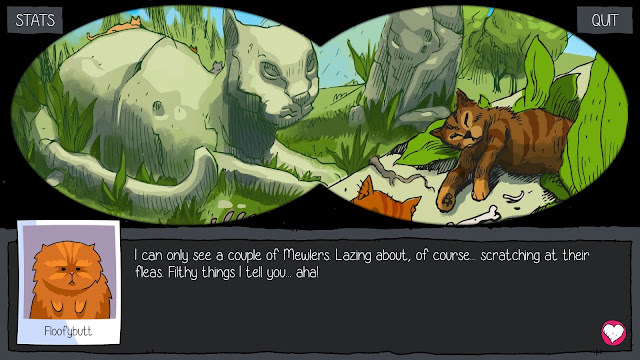 Even with glasses I often find game text difficult to read or blurry, but this isn't the case in Purrfect Date and it made me remarkably happy. So I could create a laundry list of what I like in Purrfect Dating, but in the end I think this sums it up best: I can't stop screencapping because it is all just so adorable or hilarious, or both. Now I have a folder with hundreds of cat-loving screencaps that nobody will ever see again. I feel like Floofybutt hoarding goodies he finds on the island. I have a cat problem and I'm proud of it!